tattoo tuesday continues - the human adorned by today's body art is arabelle the founder of acenda yoga in lakewood. i can't believe i didn't capture arabelle's beautiful face in this snap - i was so focused on the art and listening to the story of the tats i flaked! 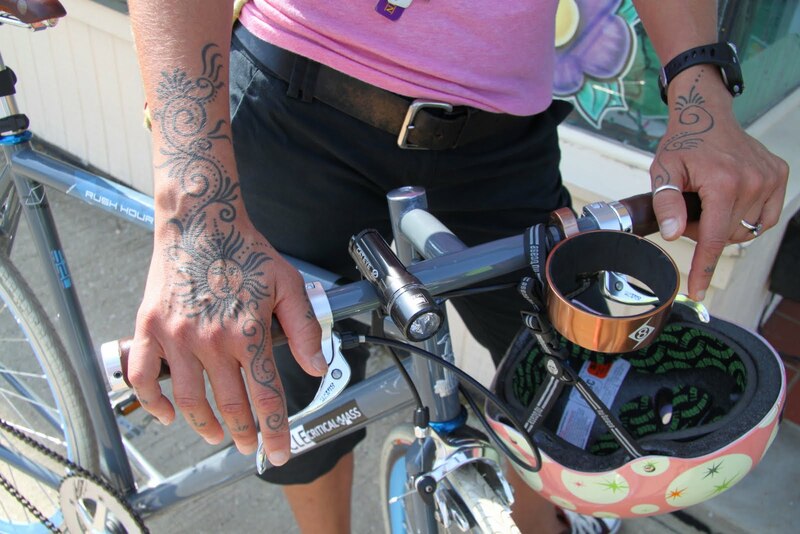 the hand and forearm tats are inspired by arabelle's fondness for mehndi designs. in the past she would get traditional henna mehndi tattoos, but she was always sad when they would fade away, so she found a way around that problem and got inked! 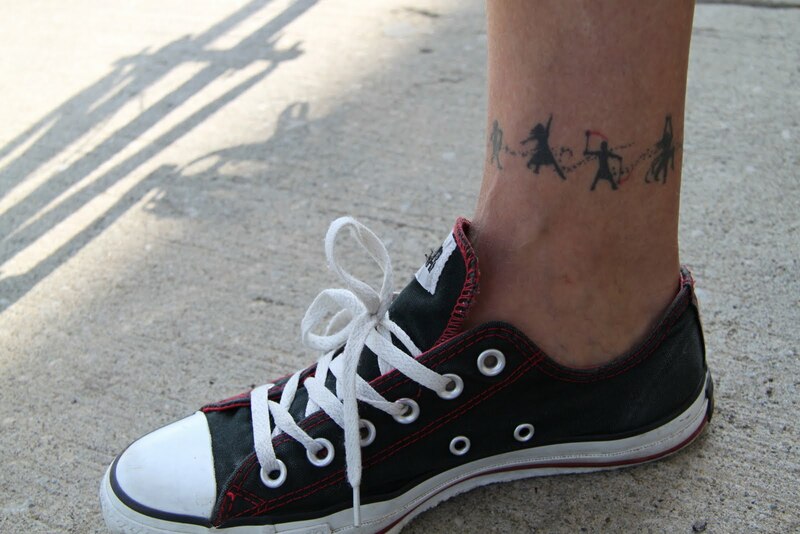 the ankle tat represents aspects of arabelle's life. as i was reflecting on this design, i thought of this image - kinda of funny since arabelle is a yoga teacher! george harrison singing his wonderful song here comes the sun, accompanying george is a slew of other notable musicians - how many can you identify and name? according to the caption this vid came from the second annual prince and trust concert - the prince's trust is a uk charity, which isn't without controversy according to the portal. the first all star concert was held in 1986, so this vid was made in 1987 which is confirmed on george's wiki page. Kimy, you'll enjoy this story about George Harrison. My husband, close friends of ours and I were dining at a nice restaurant in San Diego one night. It was my husband's birthday and about 18 years ago. In walk Deepak Chopra, Ravi Shankar and George Harrison. Linda, my GF & I, were flabbergasted. Chopra lives in La Jolla and everybody knew Harrison visited him there. We were so excited (and drunk) we bribed the waiter to get his hapkin when he was done eating. We did not approach them or anything as we didn't want to be intrusive but I kept the napkin. Dumb, but memorable. cg - what a great story. i have to hand it to you though that you guys were much better at self control than i would have been had i found myself in such close proximity to george (and ravi....and even deepak) i know myself all too well and given how much i am moved by george's life works i;m afraid i'd be going up, apologizing of course, but i'd feel compelled to gush thanks and see if i could get a hug!!!! hope you have done something wonderful and creative with the napkin! I like those tatoos, and most of all, the salutations. what a great way to start the day! Right before he died, I was compelled to listen to All Things Must Pass away. I listened to it for many days. Imagine my surprise when I learned he had died! George!! You are one of the mighty dead now. Give us a boost up, would you? We're flopping around down here!! I have the Concert for George DVD, the concert at the Royal Albert Hall put together by Eric Clapton and Jeff Lynne a year after George's passing. I always play it when I want to put my head in a better space; his music has a habit of doing that for people. love this...the tats,...the tune...and caligirls story!